The End of The upright Man is Peace". The main image depicts the virtuous man between the points of a compass which is inscribed "Bridle thy Will, Know thyself and Remember thy End". The circular frame around the image has similar cautions as does the verse below. It is likely that the image is derived from a print published by Carington Bowles of London in 1785 entitled Keep within the Compass a companion print depicts the virtuous woman within a similar design. A similar print to this one is known signed Rd. Abbey Sculp. Jph Johnson Liverpool and a print depicting the virtuous woman is known signed John Aynsley of Lane End. Between the the image and the verse this print is signed T. Baddeley Hanley. A similarly signed print on the reverse depicts a farming scene inscribed "Success to the Plough, the Fleece and the Pail/ May the Landlord ever flourish and the Tenant never fail". Reverse side with printed farmyard scene signed T. Baddeley Hanley, and inscribed "Success to the Plough, the Fleece and the Pail/ May the Landlord ever flourish and the Tenant never fail". 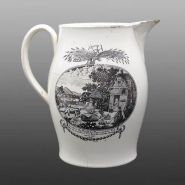 Creamware jug with black printed decoration. On one side with a complex print with emblems and mottoes of Masonic and other fraternal orders. Above the whole is a cartouche with the words "The End of The upright Man is Peace". The main image depicts the virtuous man between the points of a compass which is inscribed "Bridle thy Will, Know thyself and Remember thy End". The circular frame around the image has similar cautions as does the verse below. 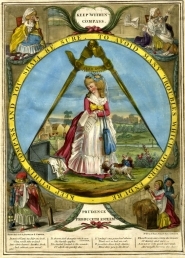 It is likely that the image is derived from a print published by Carington Bowles of London in 1785 entitled Keep within the Compass a companion print depicts the virtuous woman within a similar design. A similar print to this one is known signed Rd. Abbey Sculp. Jph Johnson Liverpool and a print depicting the virtuous woman is known signed John Aynsley of Lane End.